Everyone wants to target “social networkers” these days, it seems. 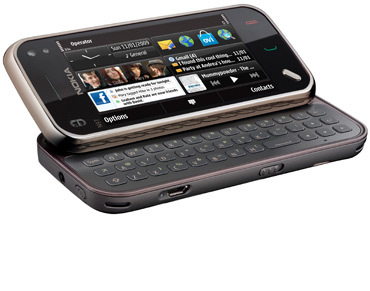 If you spend your time on Facebook and Twitter while on the move, Nokia wants to sell its latest N97 mini handset to you. Based on the Nokia N97, but marginally smaller and lighter, it packs in a full slide-out QWERTY keyboard, 5-megapixel Carl Zeiss Tessar lens with autofocus and flash, VGA video capture at 30fps, A-GPS, and 8GB of internal memory expandable up to 24GB via microSD card. Nokia is making a big noise about the latest addition to its Ovi online service — Lifecasting. The basic idea is that you can update your Facebook status directly from the customizable home page of the N97 mini, and because of GPS, your phone always knows where you are. Other than that, you get much as you’d expect from a Nokia N Series phone: Internet access, music player, email, decent camera, advanced messaging, maps, and access to the Ovi Store.